The elephant is the largest land mammal on earth and perhaps one of the most intelligent. The trunk of the elephant has two finger-like structures at its tip that allow the animal to perform both delicate and powerful movements. Its remarkable tusks first appear when the animal is two years of age and continue to grow throughout life. Elephants use tusks for peeling bark off trees, digging for roots, herding young, “drilling” for water and sometimes as a weapon. Male African elephants reach a length of 18 to 21 feet and weigh up to 13,200 pounds. Females are about two feet shorter and weigh half as much. Asian elephants are usually smaller than African elephants and have the highest body point on the head. Their backs are convex or level, and their ears are small with dorsal borders folded laterally. Their feet have more nail-like structures than those of African elephants—five on each forefoot, and four on each hind foot. Elephants can live 50 to 60 years. Elephants are capable of surviving in nearly any habitat that has adequate quantities of food and water. They spend about 16 hours a day eating. Their diet is varied and includes grass, leaves, twigs, bark and fruit. Elephants form deep family bonds and live in tight social units. A family is led by an older matriarch and typically includes three or four of her offspring and their young. Males leave the family unit between the ages of 12 and 15 and may lead solitary adult lives. Elephants live in a very structured social order. The social lives of male and female elephants are very different. The females spend their entire lives in tightly knit family groups made up of mothers, daughters, sisters and aunts. These groups are led by the eldest female, or matriarch. Adult males, on the other hand, live mostly solitary lives. The social circle of the female elephant does not end with the small family unit. In addition to encountering the local males that live on the fringes of one or more groups, the female's life also involves interaction with other families, clans, and subpopulations. Most immediate family groups range from five to fifteen adults, as well as a number of immature males and females. When a group gets too big, a few of the elder daughters will break off and form their own small group. They remain very aware of which local herds are relatives and which are not. Elephant social life, in many ways, revolves around breeding and raising of the calves. A female will usually be ready to breed around the age of thirteen, at which time she will seek out the most fit male to mate with. Females carry their young for almost two years. At birth, the calf weighs about 250 pounds. A cow may give birth every three to four years. Elephants have a very long childhood. They are born with fewer survival instincts than many other animals. Instead, they must rely on their elders to teach them the things they need to know. The ability to pass on information and knowledge to their young has always been a major asset in the elephant's struggle to survive. Today, however, the pressures humans have put on the wild elephant populations, from poaching to habitat destruction, mean that the elderly often die at a younger age, leaving fewer teachers for the young. All members of the tightly knit female group participate in the care and protection of the young. Since everyone in the herd is related, there is never a shortage of baby sitters. In fact, a new calf is usually the center of attention for all herd members. All the adults and most of the other young will gather around the newborn, touching and caressing it with their trunks. The baby is born nearly blind and at first relies, almost completely, on its trunk to discover the world around it. After the initial excitement dies down, the mother will usually select several full time baby sitters, or "allomothers", from her group. They walk with the young as the herd travels, helping the calves along if they fall or get stuck in the mud. The more allomothers a baby has, the more free time its mother has to feed herself. Habitat loss and the ivory trade are the greatest threats to the elephants’ future. 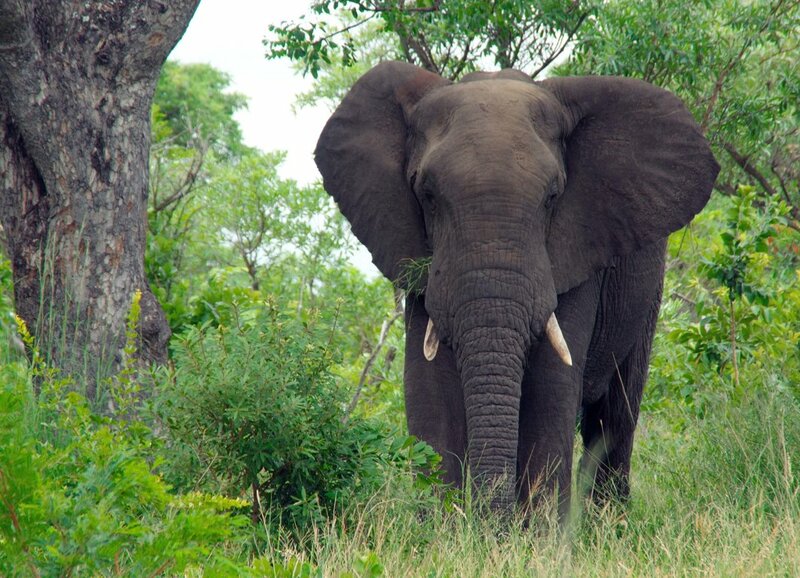 The threat to the African elephant presented by the ivory trade is unique to the species. Another threat to elephant's survival in general is the ongoing cultivation of their habitats with increasing risk of conflicts of interest with human cohabitants. Lacking the massive tusks of its African cousins, the Asian elephant's demise can be attributed mostly to loss of its habitat. Elephants need massive tracts of land because, much like the slash and burn farmers, they are used to crashing through the forest, tearing down trees and shrubs for food and then cycling back later on, when the area has regrown. As forests are reduced to small pockets, elephants become part of the problem, quickly destroying all the vegetation in an area, eliminating all their resources. Larger, long lived, slow breeding animals, like the elephant, are more susceptible to overhunting than other animals. They cannot hide, and it takes many years for an elephant to grow and reproduce. Elephants in captivity lead miserable lives. In stark contrast to their natural tendency to roam several miles each day, they are bound in shackles and chains and forced to perform tasks that are the antithesis of their innate instincts. For a short time, it was illegal to capture a wild elephant for use in a circus or zoo, but the CITES decision in 1997 changed all of that. The training endured by circus animals is almost always based on intimidation; trainers must break the spirit of the animals in order to control them. It is not uncommon for an elephant to be tied down and beaten for several days while being trained to perform. While zoos may appear to be educational and conservation-oriented, most are designed with the needs and desires of the visitors in mind, not the needs of the animals. Many animals in zoos exhibit abnormal behavior as a result of being deprived of their natural environments and social structures. Most animals in zoos were either captured from the wild or bred in captivity for the purpose of public display, not species protection.